Non-dermatologists refer to any pigmented skin spot or growth as a mole. Dermatologist call any cluster of pigment cells, whether raised or flat, pigmented or skin-colored a mole or a nevus. Pigment cells, the so-called melanocytes, reside normally at the base of the superficial layer of the skin, the epidermis. They are shaped like an octopus, spitting out pigment particles, i.e., melanin, which the neighboring keratinocytes engulf, and house them like a cap on top of their nuclei. Benign clusters of the melanocytes, i.e., nevi (the plural of nevus), can populate the border of he epidermis and the dermis, or be present within the dermis. Benign thickening of he outer layer of the skin, the keratinocytes, are commonly noted stuck-on growths that have a rough warty brain-surface appearance. 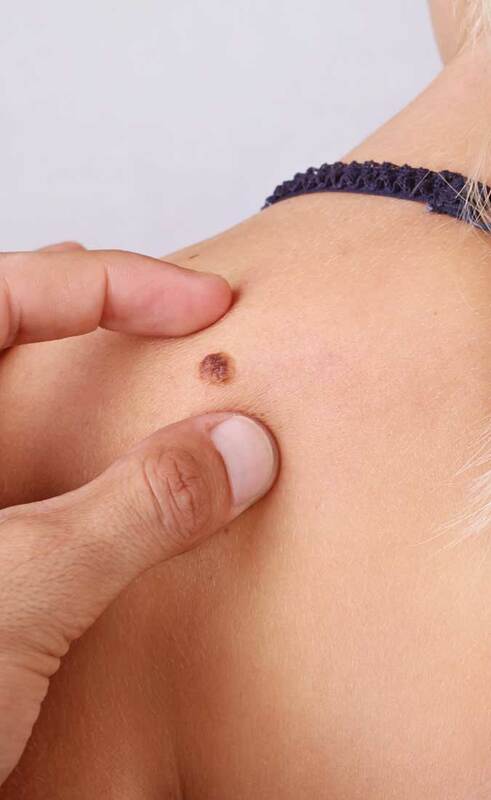 Non dermatologists call them moles, but the dermatologists call them seborrheic keratosis. Seborrheic keratoses behave very differently than nevi, and can be removed somewhat differently. Seborrheic keratoses become itchy commonly, whereas, nevi become itchy rarely. Nevi can be unicolored, or be two-toned and, in addition, have irregular borders. Two-toned nevi with irregular borders should be screened regularly, and people who have them on their skin should be screened by a dermatologist at least once a year. The development of seborrheic keratoses and nevi are genetically determined. Environmental factors, such as ultraviolet light exposure, sunburns of the past, exposure to air pollutants, and traumatic events such as repeated excessive heat exposure or friction of a rough loofa can contribute to the development of them in genetically predisposed people. Nevi can be present at birth or early childhood, but seborrheic keratoses develop after the second decade. The nevi that are present in early childhood behave biologically differently than nevi that are acquired from teenage years onward. In great majority of cases a seborrheic keratosis, or a nevus, even if it is perfectly flat, can be removed with the shave technique. The shave technique involves injecting an anesthetic, which often raises the mole just high enough to be shaved off. Because the wound does not involve the full thickness of the dermis, the procedure often does not result in in any permanent scar. Seborrheic keratoses can be removed completely without leaving any permanent mark. In certain instances, a mole has to removed with a small cylindrical blade, or be cut out, in which case the site often requires to be sutured. Even when suturing is required, the procedure can be done in such a way to leave minimal scar. If the goal is to simply lighten the color of a nevus, lasers can be applied. Lasers can completely depigment sun-spots, but not nevi in all cases. HOW DOES LASER MOLE REMOVAL WORK? Lasers emit dense beams of light that are selectively absorbed by a certain compound. each substance in nature absorbs a certain wavelength of light best. For example, chlorophyll in green leaves absorbs the green wavelength of sun light best. The pigment particles in human skin absorb most visible and ultraviolet wavelengths of light. Often the 532 nm wavelength of light is employed to heat pigmented lesions, because that wavelength does not heat the water in the skin as much, and for other reasons that are beyond the scope of this website. The heated pigment particles that are clustered in the pigmented cells damage or kill off the nevus cells. The light of the laser can penetrate the skin to a limited depth only. If some of the nests of the pigment cells are located deep within the skin, they could repopulate the surface of the skin in a few weeks or months. The laser treatment of nevi often results in temporary discoloration of the skin, which resolves completely in a few weeks. HOW MANY LASER MOLE TREATMENTS ARE REQUIRED? The sun spots, or the so-called liver spots clear up in a one or two sessions, however, the response of nevi to the laser treatment vary widely. IS LASER MOLE REMOVAL SAFE? The light that is emitted from the pigmented lesion laser is within the visible light range. No one has reported cancer having been induced as a result of prior laser treatment. However, Dr. Silvers is cautious, and offers shave removal as the first line of treatment. What happens after laser mole treatment? Immediately after treatment, the nevus turns darker. The immediate post-laser treatment darkness fades over the next few weeks, depending on the nevus and the patient’s natural skin color. The final result begins to manifest six to eight weeks later.